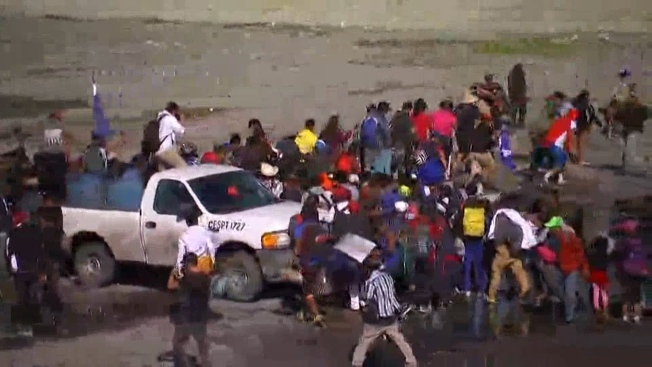 Leaders among the migrant caravan in Tijuana, Mexico are distributing flyers in an attempt to organize a march to the border Saturday morning, according to the city's mayor. Citing an economic study, Mayor Gastélum said a Sunday incident that forced an hours-long closure of the port, one of the world's busiest land border crossings, cost his city 129 million pesos, or roughly $6.3 million, in revenue. A Department of Homeland Security source told NBC 7 the department, as well as the CBP and other allied agencies, are aware of Saturday's planned march and are discussing preparations. Friday afternoon, the CBP said it would briefly shut down the Otay Mesa West Port of Entry for an "operational readiness drill." The exercise is planned for 6 a.m. and will last approximately 10 minutes, the CBP said. The agency said that exercise was designed to "evaluate readiness and assess the capabilities of CBP facilities to make sure necessary preparations."